What is the NC500? It's the scenic drive that begins in Glasgow and ends in Edinburgh, Scotland. This beautiful tour wraps around the West Coast of Scotland reaching all the way up into Orkney before coming back down the East Coast to Edinburgh. 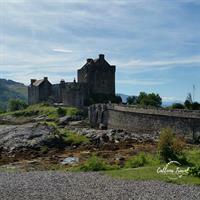 The scenery along Scotland's coastline is astonishing and you'll also visit Eilean Donan Castle, the Isle of Skye, Inverewe Gardens, Skara Brae, Dunrobin Castle, Urquhart Castle, Culloden Battlefield, and the imposing Edinburgh Castle. Visit all three of Scotland's large cities; Inverness -Gateway to the Highlands, Edinburgh - Scotland's capital, and Glasgow - Scotland's largest city. Your tour will include most meals, stays in beautiful and centrally located hotels, and a local guide. Plan your trip for August and the Military Tattoo at Edinburgh Castle is included in your escorted tour price. I've been and it's really a spectaclar display. Warning though - the lone bagpiper at the end of the show will leave you a little misty-eyed! Message me today for more information and to secure your spot on this incredible tour.